Departments: This is a last call for an easy way to securely dispose of your paper records. Shred Day is 8:30–11 a.m., Wednesday, Oct. 24. Call iTAC by Friday, Oct. 19 to schedule a pickup: 785-532-4918. 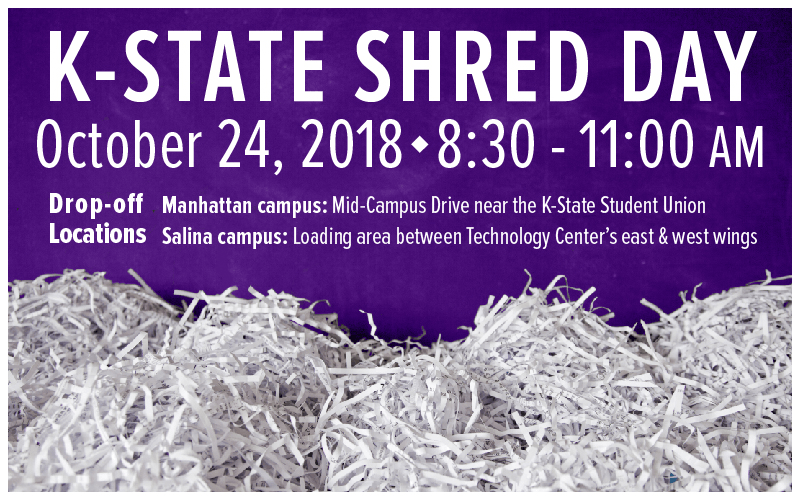 For details, see Fall 2018 Shred Day is October 24 article. Shred Day is scheduled 8:30-11 a.m. Wed, Oct. 24, to properly dispose of university paper records on the Manhattan and Salina campuses. Please review the university retention schedule to ensure accuracy in sending records for destruction. Further policy information governing records management includes the university’s records retention policy, PPM Chapter 3090. Hard Drive Recycling Day is scheduled 8:30-11 a.m. Tuesday, Oct. 31, on the Manhattan campus to help departments properly dispose of old hard drives from university computers, printers, scanners and faxes. 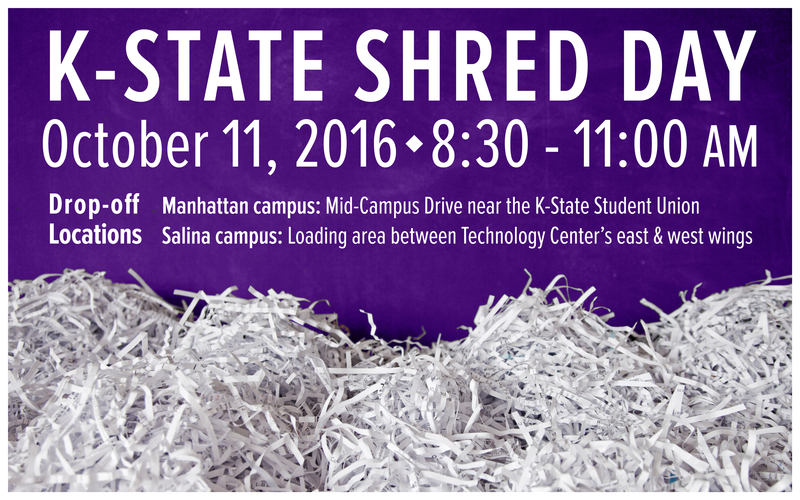 Shred Day is scheduled 8:30-11 a.m. Tuesday, Oct. 11, to properly dispose of university paper records on the Manhattan and Salina campuses. Manhattan campus: Deliver to Mid-Campus Drive near the K-State Student Union. Salina campus: Deliver to the loading area between the east and west wings of the Technology Center. Departments: Today is Hard Drive Recycling Day. 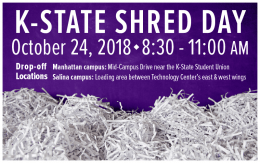 From noon to 4 p.m., take your hard drives to the iTAC representative at the circle drive on the east side of the K-State Student Union. For more information on how to safely and securely dispose of used hard drives, see Hard Drive Recycling Day is Tuesday, Nov. 3 (IT News, Oct. 19).